At Salisbury Antiques Centre we have a large selection of stock, mostly comprising of English and Continental 18th and 19th Century furniture. We also have a good selection of antique country furniture from both England and France with some more extravagant walnut pieces from the Low Countries. Salisbury Antiques Centre now also stocks a selection of good quality painted antique furniture to cater for those going for the more contemporary look but with added character. There is also an impressive array of antique interiors, including a fantastic selection of antique mirrors ranging from charming antique dressing table mirrors to palatial antique overmantel mirrors. The Centre also houses many other period and decorative items for the home such as antique oil paintings, antique bronzes, and antique clocks. There is also a well stocked cabinet of antique weaponry, always housing something of interest to the avid collector. Displaying items for over twenty established and respected dealers from across the UK and Europe, with approximately 14,000sq/ft of showrooms on three floors, Salisbury Antiques Centre is one of the largest antique centres in England. The Centre also ensures that all items on display are of ‘showroom quality’ and are clearly and correctly labelled. We are a popular destination for trade buyers and interior designers with the emphasis on quality and affordability, making Salisbury Antiques Centre a 'must visit' destination for the serious buyer and curious browser alike. 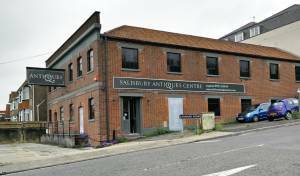 Situated on the A36 (Wilton Rd) just outside Salisbury town centre, the Centre is easy to find and has ample parking. Alternatively, Salisbury train station is nearby and one of the team is always available to pick you up or drop you back at the station should you wish. If you are not able to visit us please enjoy browsing our current stock on the website, and feel free to call us even if you can’t find what you’re looking for online as our helpful staff are always ready to offer their advice or keep an eye out for that elusive item.